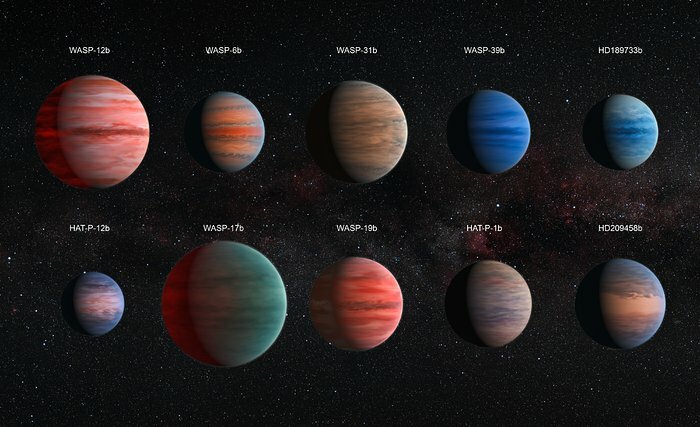 This image shows an artist’s impression of the ten hot Jupiter exoplanets studied by David Sing and his colleagues. The images are to scale with each other. HAT-P-12b, the smallest of them, is approximately the size of Jupiter, while WASP-17b, the largest planet in the sample, is almost twice the size. The planets are also depicted with a variety of different cloud properties. There is almost no information about the colours of the planets available, with the exception of HD 189733b, which became known as the blue planet (heic1312). The hottest planets within the sample are portrayed with a glowing night side. This effect is strongest on WASP-12b, the hottest exoplanet in the sample, but also visible on WASP-19b and WASP-17b. It is also known that several of the planets exhibit strong Rayleigh scattering. This effect causes the blue hue of the daytime sky and the reddening of the Sun at sunset on Earth. It is also visible as a blue edge on the planets WASP-6b, HD 189733b, HAT-P-12b, and HD 209458b.